“This garden brings us together – as sisters. We became a lot like family lately and it reminds us of our younger days when we helped our parents in the Eastern Cape“ says Mama Bukulu. It was back in 1996, that she was in a group of 24 women and 6 men who had the idea of starting a community garden in their neighbourhood, opposite the Sizimisele Tech High School in Khayelitsha. The power lines that are still above the site prohibits anybody to build on this land and therefore enabled the space to develop into the first garden of the Siyazama Community Allotment Garden Association (often referred to as SCAGA). Abalimi supported the energetic group through training courses, organising the land and providing fences, windbreaks, irrigation and the layout. Since most of the group grew up in rural parts of the Eastern Cape, they had a background in gardening and were used to fertile, loamy soil. Being confronted with the poor, sandy soil of the Cape Flats, they had to make compost and improve it through trench beds and mulching. Today, a group of six women farmers is taking care of Siyazama, while the rest of the SCAGA line has evolved into a row of many community gardens. Sometimes also referred to as the “power line project”, it now is a leading micro-urban agriculture model in Cape Town and almost certainly in South Africa. SCAGA is Abalimi’s main ‘laboratory’ for determining methodology and appropriate technology required to establish sustainable organic micro-urban agriculture projects on marginal land. This is also the home of Abalimi’s Young Farmers Training Centre (YFTC) to teach people how to to grow organic crops for sale and for eating at home, while conserving indigenous flora and promoting alternative farming technologies. The farmers are looking forward to winter, since they run their soup kitchen for people in need and elders, using a biodigester which is building gas from organic waste. ”We’re sharing a lot here: our ideas, our views, our health, everything” says Mama Pat. 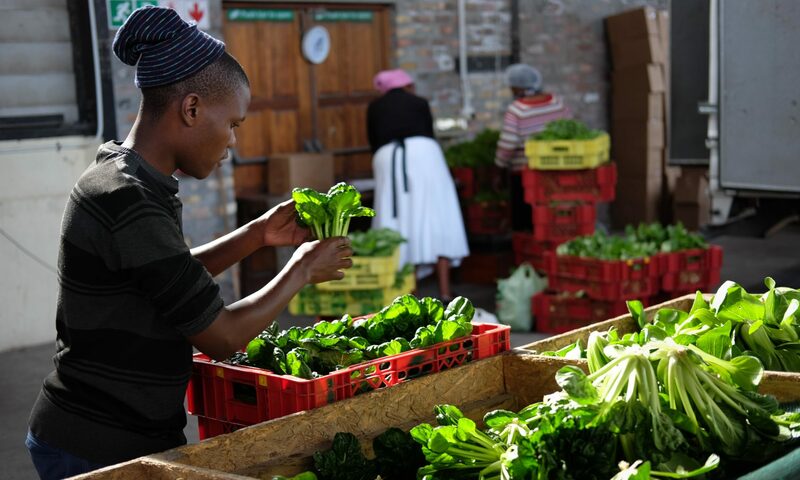 Their hopes and goals for the future are to become more self sufficient, sustainable and independent by maybe growing their own seedlings and having their own truck to drive their veggies to market. They also have a community hall that is used for church on a Sunday, while it is during the week it is used for training and community meetings. The Mzamo Women’s Group meets here to do beading and sell their products to tourists who visit the garden. On Sunday’s after church they have a market where they sell fresh veggies from the garden.